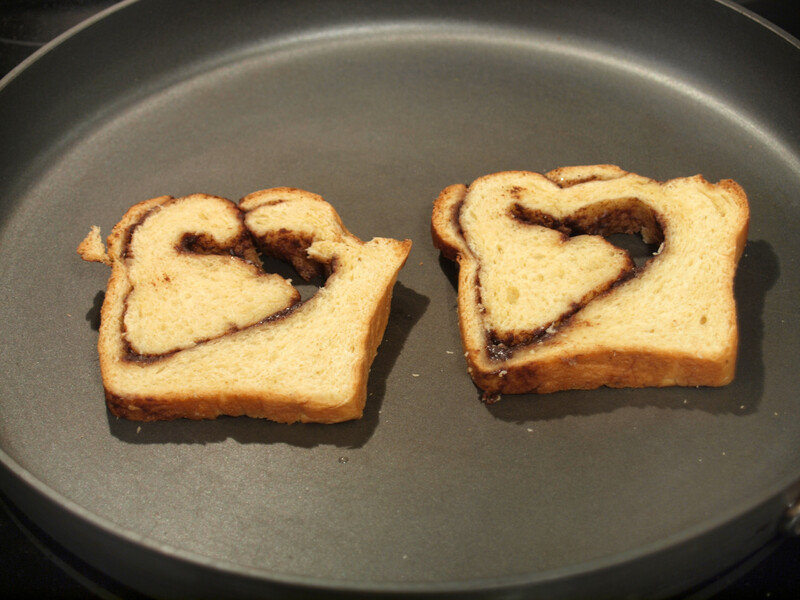 Once the cinnamon bread was chosen, it was time to find a matching cheese. I honestly had no good ideas except for maybe Brie, although that probably wouldn’t have been very good. Heck, what do I know?! The sous chef traveled to The West Side Market, where they have the Cheese Shop, home of many different cheeses. Thankfully, the nice cheesemonger there had a great suggestion: Wisconsin Gruyere Surchoix. This cheese was fresh off the truck and ready to be melted. Unfortunately, when doing a google search, I couldn’t find any descriptions of this particular Gruyere. In my opinion, it is creamy and had a bit of a nutty flavor. 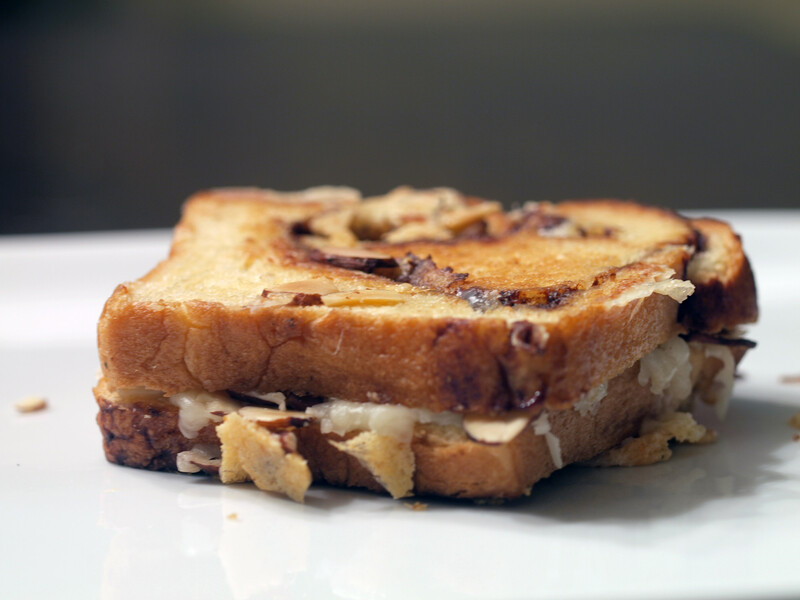 It ended up being the perfect cheese for this nutty grilled cheese. 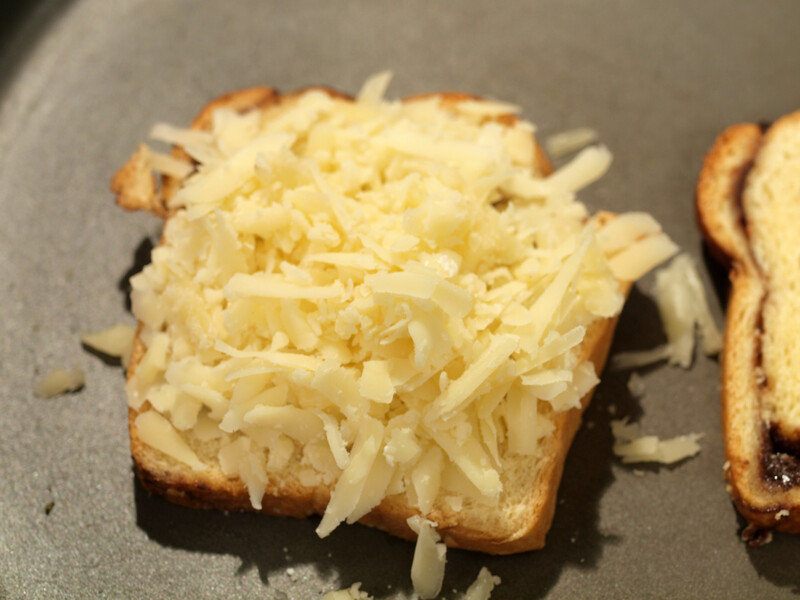 This grilled cheese was created from many different sources in many different cities. We purchased the cinnamon bread in Pittsburgh and the cheese from Downtown Cleveland. Now it was time to choose the accompanying ingredient(s) from another city. For that, the sous chef went to our cheesemonger friend at Whole Foods. 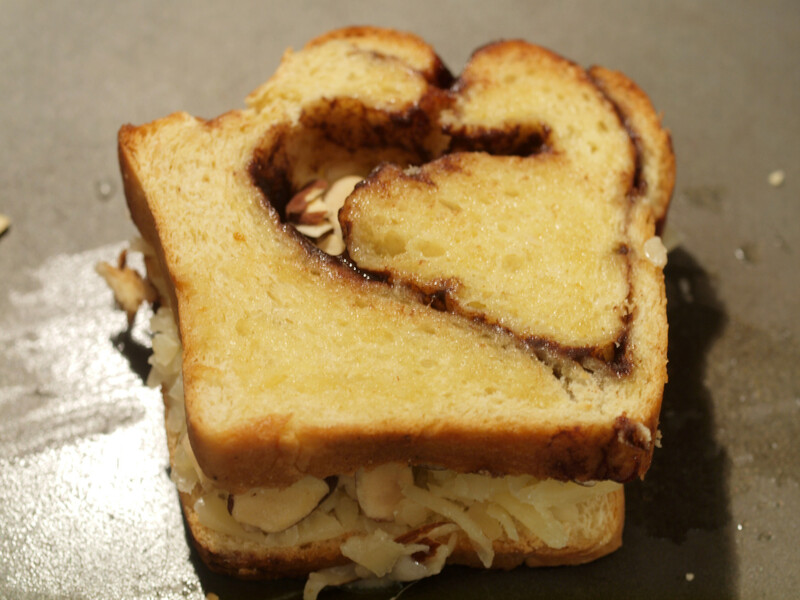 Jason thought everything sounded great but was unsure what else we should include on this particular grilled cheese. 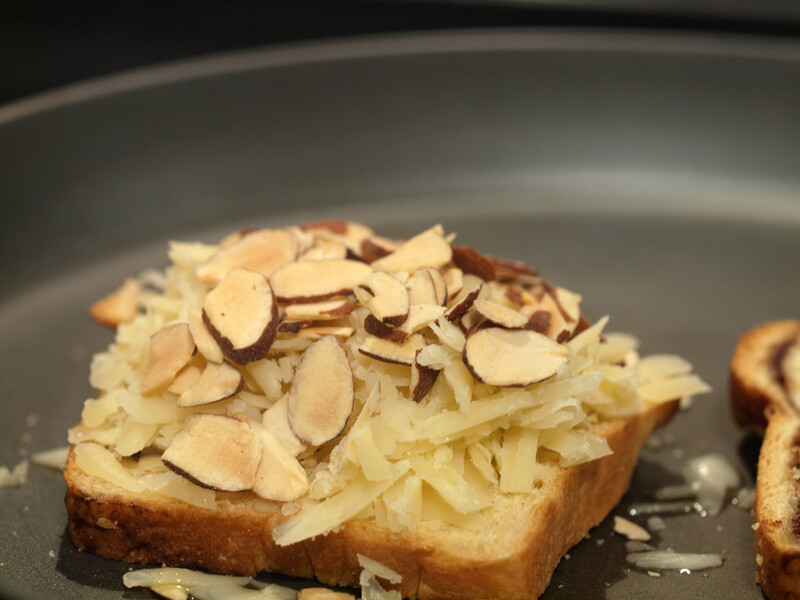 The sous chef suggested sliced almonds and Jason thought that was a great suggestion. The almonds reminded me of the hazelnuts I recently used, but I was up for trying another nut. 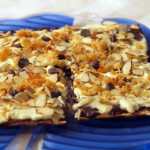 The almonds would pair well with the nutty cheese. Seemed like a great idea to me. Well done, sous chef. Well done. As was the case with the hazelnuts, I toasted these in the oven at 350* for about 15 minutes. This helps intensify the flavors, which is never a bad thing. 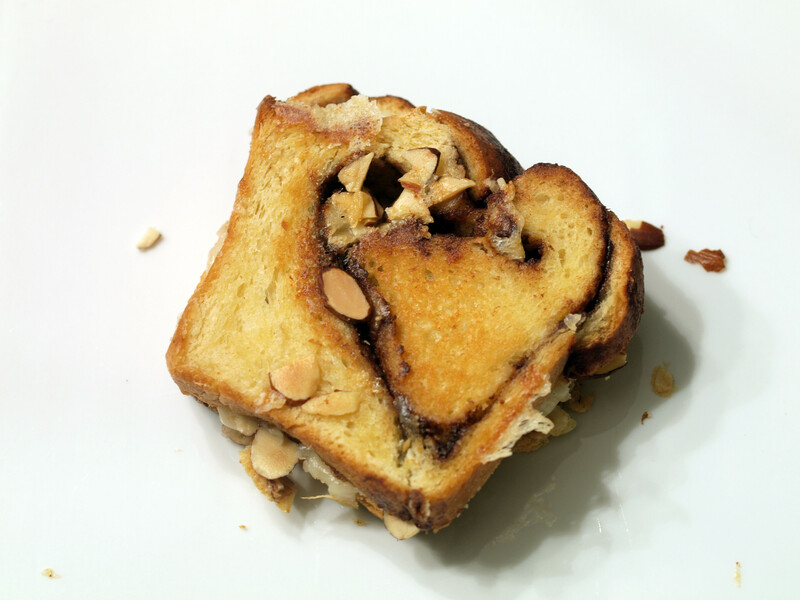 What can one say about cinnamon bread? It is absolutely delicious and has a great sweet flavor. 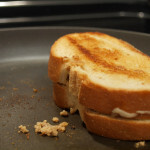 This particular cinnamon bread was delicate and crumbly, almost causing problems when trying to cook the grilled cheese. Thankfully, the sous chef kept everything in tact long enough for me to dive in. Mmmm. I have to thank everyone who helped in creating this grilled cheese, including both cheesemongers (Cheese Shop & Whole Foods) as well as the sous chef. I sat back and allowed other people to create this grilled cheese. 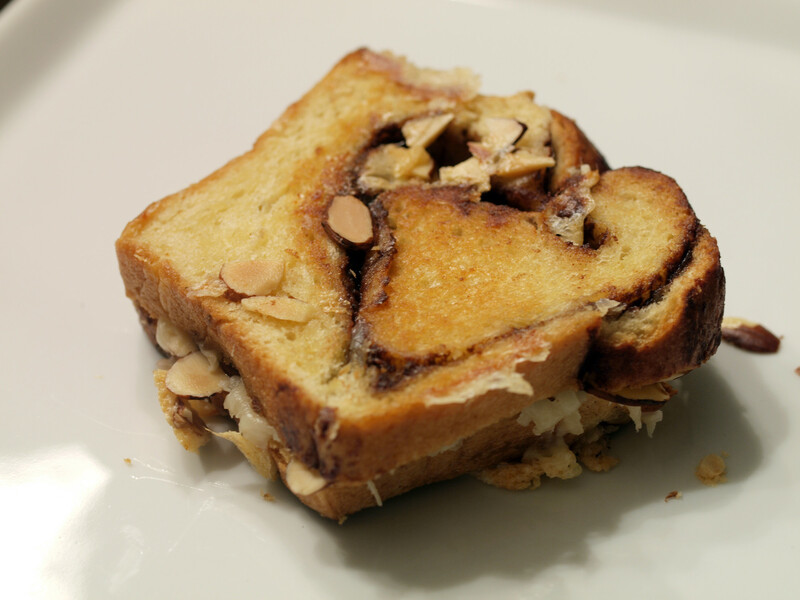 The combination of sweet cinnamon bread with sweet, nutty gruyere created a new flavor that just melted together. 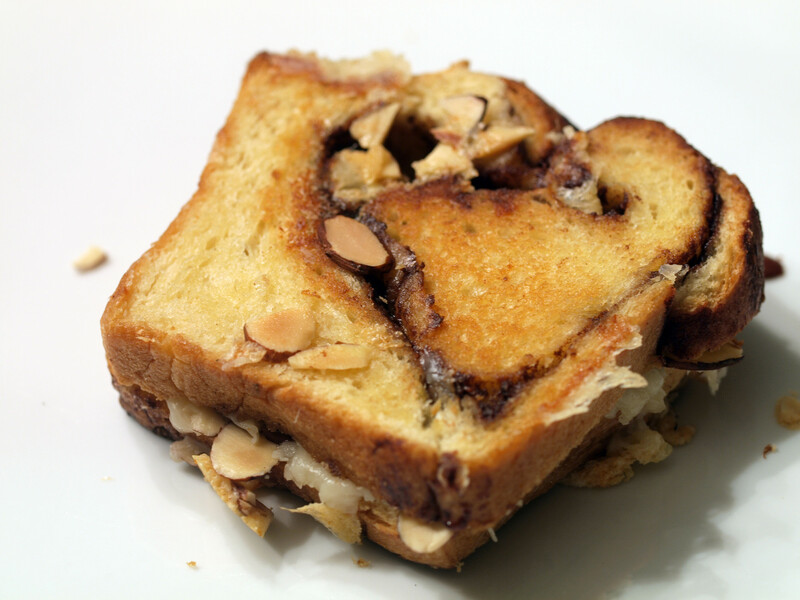 The inclusion of the toasted almonds added a nice crunch that would have been otherwise missing. 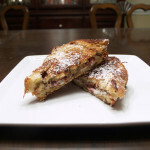 Overall, this grilled cheese was great as a meal, but could also work as a dessert. 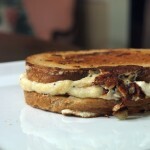 Posted in Grilled Cheese and tagged A, almonds, cinnamon bread, grilled, gruyere, gruyere surchoix. This looks really good. Do you have any recommendations for a side dish to go with it? Perhaps a soup? Honestly, I personally have no idea and I forget what I had. Sorry. The sous chef suggests some sort of vegetable (broccoli souffle/creamed spinach) or sweet potato fries. Hope that helps! This is probably the cheese you used for the sandwich. Rose Kase has a wonderful tradition of making very fine cheeses. I used to work in a cheese shop, and we sold their entire cheese collection! There’s a great, brief description of the cheese. 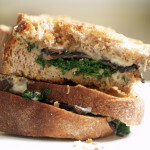 Beautiful flavors on a grilled cheese, nicely done!